A delightful compendium of Dirda’s most memorable Washington Post Book World essays revels in seven years’ worth of bibliophilic passion. 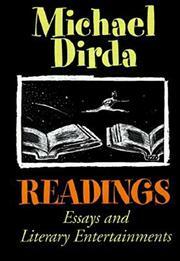 Although the 46 “literary entertainments” collected here range widely in topic and in tone (from the nostalgic reminiscences of “The Crime of His Life” to the wry apocalyptic musings of “Millennial Readings”), Dirda’s hearty enthusiasm and good-natured bookishness stands at the forefront of his writing. From pulp fiction to serious literature, children’s books to erotica, ghost stories to classics in translation, Dirda appears to have read more books—and to remember them in awe-inspiring detail—than most libraries contain. Many of the essays contain lists of little-known and forgotten novels with brief synopses of their contents, and these simple gifts leave one breathless with reverence for the man who read, recommended, and loved these countless titles. Dirda’s erudition is obvious throughout, but pedantry is not his goal; he obviously just loves books with a passion as infectious as the Ebola virus. His response to required reading in high school (“Read at Whim!”) and his hilarious suggestions to encourage children to read by forbidding them the classics reveal a man whose tongue may be firmly in his cheek but whose heart and mind never seem to stray from the joys of the printed word. The ornery reader may find a quibble or two to snipe about (Harry Potter is maligned as merely “scary and exciting” in “Tomes for Tots”), but the joy of Dirda’s opinions lies in letting the voice and wit of a true bibliophile into your head. For any book lover who—despite Kirkus’s best efforts—doesn’t know what to read next, Dirda will provide a lovely and genial guide.